A Thomas Dunne Book for St. Martin's Griffin, 9781250181718, 368pp. A lively chronicle of the year that shaped popular music forever, with an all new Spotify appendix! More than half a century ago, friendly rivalry between musicians turned 1965 into the year rock evolved into the premier art form of its time and accelerated the drive for personal freedom throughout the Western world. The Beatles made their first artistic statement with Rubber Soul. Bob Dylan released "Like a Rolling Stone, arguably the greatest song of all time, and went electric at the Newport Folk Festival. The Rolling Stones's "Satisfaction" catapulted the band to world-wide success. 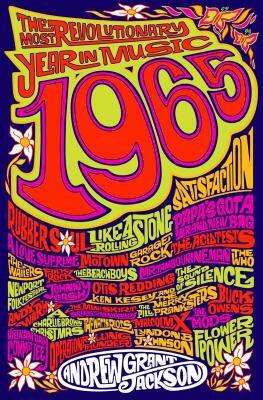 New genres such as funk, psychedelia, folk rock, proto-punk, and baroque pop were born. Soul music became a prime force of desegregation as Motown crossed over from the R&B charts to the top of the Billboard Hot 100. Country music reached new heights with Nashville and the Bakersfield sound. Musicians raced to innovate sonically and lyrically against the backdrop of seismic cultural shifts wrought by the Civil Rights Movement, Vietnam, psychedelics, the Pill, long hair for men, and designer Mary Quant’s introduction of the miniskirt. Andrew Grant Jackson is the author of Still the Greatest: The Essential Songs of the Beatles’ Solo Careers. He directed and co-wrote the feature film The Discontents (2004) starring Amy Madigan. He has written for Slate’s ‘Blogging the Beatles,’ Yahoo!, music magazines Burn Lounge, Mean Street, Dispatch and the Hollywood monthly magazine Ingenue. He lives in California. “Jackson combines personal stories with a panoramic historical narrative of the music and epic social change of 1965, a defining year for Bob Dylan, the Beatles, the Rolling Stones, The Who, James Brown, and John Coltrane.” —Publishers Weekly, "The Most Anticipated Books of Spring 2015"